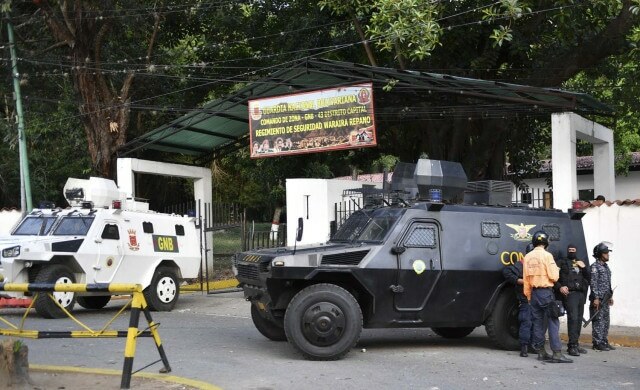 Merida, January 21, 2019 (venezuelanalysis.com)–A small group of soldiers have been arrested in the San Jose de Cotiza barracks in Caracas after they reportedly stole armaments and attempted to raise a mutiny in the Venezuelan capital. According to a statement released from the Bolivarian National Armed Forces (FANB), the mutiny began around 2:50am Monday morning, when several dozen soldiers from the 43th Command Post of the Bolivarian National Guard (GNB) in Macarao, west Caracas, overpowered their superior officer, Capitan Gerson Soto Martinez. They then proceeded to hijack two military vehicles which they used to penetrate the Urban Security Barracks in Petare, east Caracas, making away with armaments as well as kidnapping two officers and two guardsman. 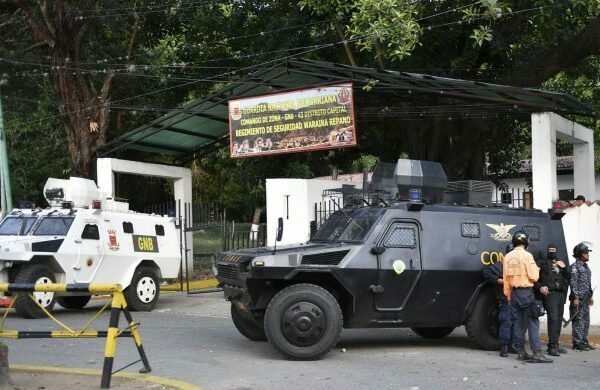 The soldiers, which the FANB described as “criminals,” then moved on to the nearby GNB Waraira Repano barracks of San Jose de Cotiza in northern Caracas, where they reportedly encountered resistance from the troops stationed there. After an hour-long standoff with police special forces units, the group finally surrendered in the presence of a military prosecutor around 8.30am and were transported to Fort Tiuna military base by the National Guard. Authorities report that all of the stolen weapons were recovered. It is unclear how many soldiers took part in the incident, and unconfirmed claims from those involved put the figure at as many as 120, whilst other reports suggested that they numbered closer to 40. Journalist Roman Camacho has reported that a total of 27 guardsmen were taken into custody, while Reuters claims 25 were detained. In response to the soldiers’ arrest, several dozen local residents took to the streets, erecting burning street barricades in support of the insurgent soldiers and against the Maduro government as well as torching government symbols. In ensuing confrontations, authorities employed tear gas and rubber bullets to restore order, making several arrests. The motive for the short-lived rebellion, as well as the intended target for the stolen weapons, remains unclear at the time of writing, with much speculation circulating on social media. The detained soldiers, who released a series of videos to social media, seem to support the position taken by Venezuela’s National Assembly (AN), which has rejected the new mandate of President Maduro, calling it a “rupture” of the constitutional order. The Cotiza incident comes on the eve of the 61st anniversary of the overthrow of the Marcos Perez Jimenez dictatorship on January 23, 1958. President Nicolas Maduro and AN President Juan Guaido have both called for marches this Wednesday, with the latter promising to install a transition government in an escalation of the political confrontation. On January 11, Guaido declared he was prepared to assume the interim presidency of the country should “the people” and “the armed forces” support him..
Last week, Guaido promised amnesty to military officials who take up arms against the Maduro government in the event a transition government is installed. “The National Assembly is committed to offering all necessary guarantees to members of the FAN who actively contribute to the restitution of the Constitution,” he reiterated this Monday. Edited and with additional reporting by Lucas Koerner from Caracas.